Randomly last month I saw General Chuck Yeager fly by on my Twitter feed, trying to get himself to 70,000 followers in time to celebrate the 70th Anniversary of breaking the sound barrier (he more than met that goal and has 77K followers as of today)- not even realizing that General Yeager was still out there in the world and being sort of tickled by the fact that he was on Twitter, I obliged him and then I kind of got the itch to see the beginning of The Right Stuff to watch their portrayal of his record breaking flight and then I just kept right on watching, because well, it's a great movie! Telling the story of America's first nine astronauts that launched the Mercury Program and began to space race which culminated in Neil Armstrong and Buzz Aldrin landing on the moon, The Right Stuff opens in 1947 in the high desert of California at Edwards Air Force Base (at the time I guess it was called Muroc Army Air Field?) where test pilots fly high speed air craft like the Bell X-1 pushing the envelope of man and machine faster than humanity thought possible at the time. Many die as a result. When one pilot demands $150,000 in an attempt to break the sound barrier, the chance to fly the Bell X-1 falls to Captain Chuck Yeager. (Sam Shepard). While on a horseback ride with his wife, Glennis (Barbara Hershey), Yeager takes a fall and breaks some ribs which prevents him from leaning over and securing the hatch to the X-1. A fellow pilot, Jack Ridley (Levon Helm) rigs up a broom handle which helps Yeager to secure the door and he takes the X-1 out on a flight and breaks the sound barrier. Six years after that first flight, Edwards Air Force Base is still attracting the best test pilots, including young hotshots, Gordon Cooper (Dennis Quaid), Gus Grissom (Fred Ward) and Deke Slayton (Scott Paulin) who want to prove that they're as good as now Major Chuck Yeager and his friendly rival Scott Crossfield (Scott Wilson) who keep breaking each other's speed records. Their wives carry the heavier burden of being terrified of becoming widowed by the dangerous work their husbands do and for Trudy Cooper (Pamela Reed) it proves to be too much as she heads back to San Diego to her parents house for awhile. The 1957 launch of Sputnik, however changes everything and suddenly there is massive political pressure for America to catch up to the Soviets in the now declared space race. 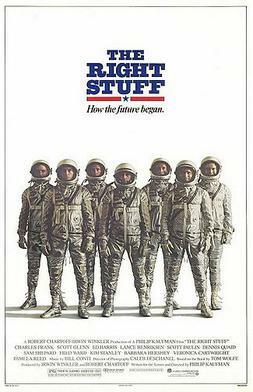 Deciding that they want men with a college degree, Yeager is excluded from the search for America's first seven astronauts, but Cooper, Grissom and Slayton are joined by John Glenn (Ed Harris), Alan Shepard (Scott Glenn), Walter Schirra (Lance Henriksen), and Scott Carpenter (Charles Frank) and after going through a series of grueling physical and mental test, they become the Mercury Seven- America's first astronauts. Despite the momentum the Americans have picked up, Russia beats them into space again, launching Vostok 1 on April 12, 1961 with Yuri Gagarin on board, which only increases the determination of the astronauts to get in the game and beat the Russians. Eventually, Alan Shepard becomes the first American to reach space on the Mercury Redstone-3, Grissom follows on the Mercury Redstone-4, but experiences a slight setback when the capsules hatch blows prematurely and it fills with water and sinks before it can be recovered- many accuse Grissom of panicking and blowing the hatch prematurely. John Glenn follows on the Mercury Atlas-6 and becomes the first American to orbit the Earth surviving a possibly loose heat shield on re-entry to come home to a ticker tape parade. The movie closes with Gordon Cooper having a successful launch on the Mercury-Atlas 9 ending the Mercury program- he was the last American to fly into space alone.